Does anyone think Zotac's teeny little Zbox Nano is too big? 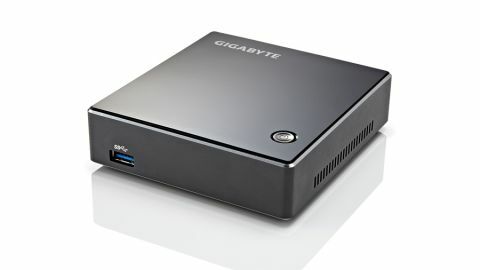 Gigabyte seems to, as its Brix bundle of cuteness is a proper PC in a box, but around 50% smaller than even the Nano. This translates to a 115 x 108 x 30mm form factor, though like Zotac's design, the Brix comes as a barebones unit, so its price isn't quite the bargain it appears. Our example came with a whopping 16GB of dual-channel DDR3-1600 RAM and a 120GB mSATA drive, courtesy of memory maestro Kingston. You'll need to factor all this into the price you expect to pay, plus an OS. This all adds up, and it isn't like you get much in the way of connectivity for your newly empty wallet either. The Brix has to make do with Ethernet, HDMI, a mini DisplayPort socket and two USB 3.0 inputs. Compensate for the measly mSATA storage options with an external HDD and there goes one USB port, along with the Brix's size advantage over the Zbox. Want to use a USB keyboard and mouse, and install Windows from a flash drive? Better dig out that USB hub. This is a quiet PC, though not necessarily in a good way. The CPU fan spools up fine (it has to, with peak temps hitting 85 degrees), but as there's no dedicated audio output, you won't hear much else unless you've got an HDMI-equipped monitor with speakers. The Brix is as well connected as North Korea, but it has similar firepower too. It's nearly 20% slower than the Zbox Nano in the CPU benchmarks, but kitted out with an SSD and this much RAM, you wouldn't know it in the real world. Probably thanks to this optional abundance of memory, the Gigabyte Brix turned in an even faster Grid 2 performance than the Zbox Nano, despite sharing the same Intel HD 4000 graphics. Consequently it has no trouble reeling off some full HD movies, and with this being a mobile-derived Core i5, you get Hyper-Threading for some pseudo quad-core action too. But aside from its dual-channel memory capacity and outright titchiness, even an i5-based Brix isn't a match for the versatility of the Zbox Nano. In Gigabyte's attempt to out-Intel the NUC, it's fallen into the same trap as its forbears: the Brix is just too darned small. Considering these aren't portable devices you can use on the go, what's the point in shaving every possible millimeter when the result will end up parked on a desk or TV cabinet? SFF PCs are great, and providing you don't have to sacrifice much speed or connectivity, they're a tempting proposition for the space-conscious even at these prices. However, it's hard to make a case for the little Brix when it needs a USB hub and a speaker-equipped monitor to actually cut it in the real world.